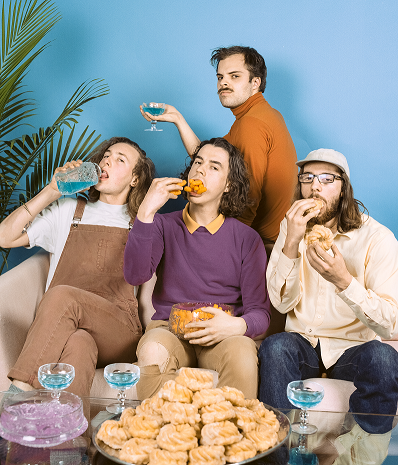 Vancouver based bedroom pop/indie rock band Peach Pit has released the official video for “Alrighty Aphrodite” from their debut album Being So Normal. Watch it HERE. Directed by Lester Lyons-Hookham, the visual was shot in one take and follows the band as they lurk into the frozen forests of Squamish, BC. Following sold out shows in New York, Toronto, and Los Angeles last month, Peach Pit has announced a North American headline tour slated for the fall. The 19-city trek kicks off October 9 at Brooklyn’s Music Hall of Williamsburg and includes stops in Washington D.C, Boston, Chicago, Los Angeles and more. See full tour routing below. Tickets go on sale Friday, 7/20 at 10am local time, visit http://peachpitmusic.com/ for more information. Peach Pit is Vancouver based band comprised of Neil Smith (vocals/guitar), Chris Vanderkooy (guitar), Peter Wilton (bass), and Mikey Pascuzzi (drums). In 2016, the group released their debut EP ‘Sweet F.A’ featuring their viral self-titled song Peach Pit, which has amassed over 14M views on YouTube. Last September, the band released their debut album Being So Normal. Melding teenage angst with bummer summer vibes that have them sounding somewhere between Mac Demarco and Homeshake, Peach Pit has developed a loyal following through extensive touring and quirky music videos.